Based on the best-selling novel and developed by the award-winning creative team of Jason Robert Brown and Marsha Norman, The Bridges of Madison County chronicles the four-day affair between an Italian war bride and a traveling National Geographic photographer who comes to Iowa to shoot the area’s fabled covered bridges. Francesca looks forward to spending a rare four days alone on her Iowa farm when her family heads to the 1965 State Fair. When a weary Robert Kincaid stops to ask directions for his assignment, the pair’s connection is instant and deep, yet short-lived. What happens will haunt them both for the rest of their lives. Hudson-Smith said the story is about the spirit of relationships – about connections and destiny, and the conflicts between duty and desire. The creative at Players team is focused on bringing the story to life using an open, minimalistic environment flowing with movement. The orchestra and lighting also will help set the tone. The 13-member cast features Erin Barnes in the role of Francesca and David Diehl as Robert Kincaid. Since rehearsals began, there has been a buzz in the community about the talent in this show. The presenting sponsor of The Bridges of Madison County is the Stage Fund, which is hosting an exclusive benefit fundraiser with Players by the Sea and Regions Bank. The benefit includes a preview performance on Thursday, Jan. 24, with pre- and post-show receptions. 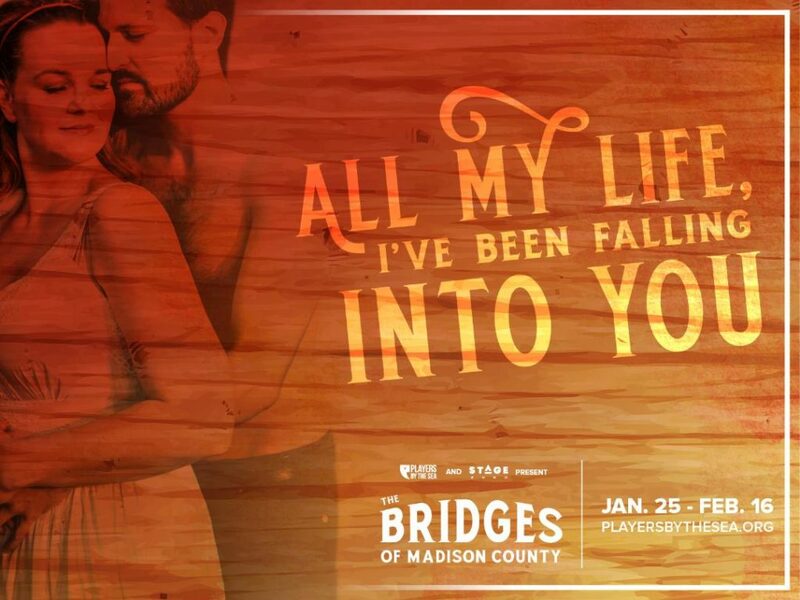 With a cast featuring some of the region’s most gifted musical theater performers, The Bridges of Madison County gives Stage Fund the opportunity to spotlight the depth of talent which it strives to nurture and fund. Performances are offered Jan. 25, 26, 27, Feb. 1, 2, 3, 7, 8, 9, 10, 14, 15, and 16. Curtain is at 8 p.m. Thursday through Saturday, and 2 p.m. on Sunday. Tickets are $28, $25 seniors, students and military. Thursday Nights are Student Nights, where students can receive half price tickets at the door with a valid student I.D. Tickets are on sale now. Visit http://www.playersbythesea.org or 904.249.0289. Players by the Sea is located at 106 6th St. N. in Jacksonville Beach. Next articleBUZZ TV – “Healthy Take” with Toccara Burgess, Let’s Go Vegan, LLC.